DENVER – A three-game win streak will be waiting for the Wild once it reconvenes after an eight-day layoff that starts with the NHL All-Star break, a run that has lifted the team to the third spot in the Central Division. And perhaps not surprisingly, this climb has been accompanied by a spike in production from the team’s offensive leaders – a trend that was at the forefront of the group’s 5-2 victory over the Avalanche Wednesday at Pepsi Center. Six of the team’s top seven point-getters have chipped in at least a goal during this three-game stretch, and all eight of its point leaders have managed at least a point. Among the headliners are center Eric Staal, who’s scored three times in his last two games and boasts nine points in his past six, and Coyle has a goal in back-to-back contests – notching four points in his last three. The top defensive pairing has also been involved. Jared Spurgeon has 10 points, including four goals, in his last 12 games, ranking tied for second among NHL defensemen in goals and tied for fifth in points in that span. And Ryan Suter went into the break with three points in his last two games. His goal against the Avalanche, No.6 on the season, matched his output from 2017-18. More subtle plays were also critical for the Wild. Winger Pontus Aberg kept the play alive in the Avalanche’s zone with a save at the blue line during a Wild power play – which led to a holding penalty by defenseman Ian Cole to give the Wild a 5-on-3 look that it converted. And defenseman Nick Seeler had three shot blocks in the same shift to help set up an eventual insurance goal by Coyle. 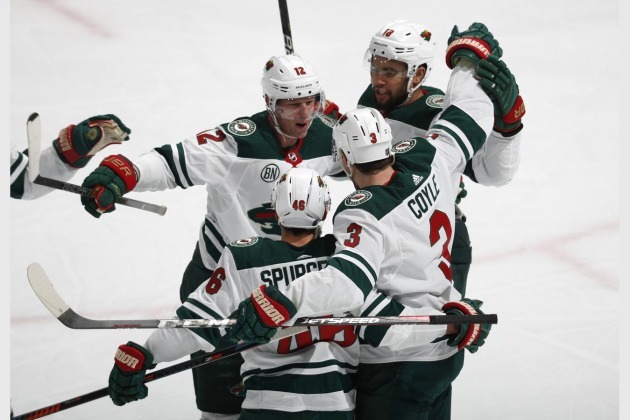 Overall, the power play contributed twice, encouraging output for a unit that’s been struggling to recalibrate since the loss to defenseman Matt Dumba to a torn pectoral muscle. Both goals came during a 5-on-3 advantage, but it looks like the units – which features newbies in Aberg and defenseman Brad Hunt – is finding a groove. After starting his Wild debut alongside Jonas Brodin, Hunt ended it next to Nick Seeler – a change that seemed to suit the recently-acquired defender as he seemed to get more comfortable as the game progressed. Overall, Hunt logged 16 minutes, 50 seconds while finishing a minus-1.